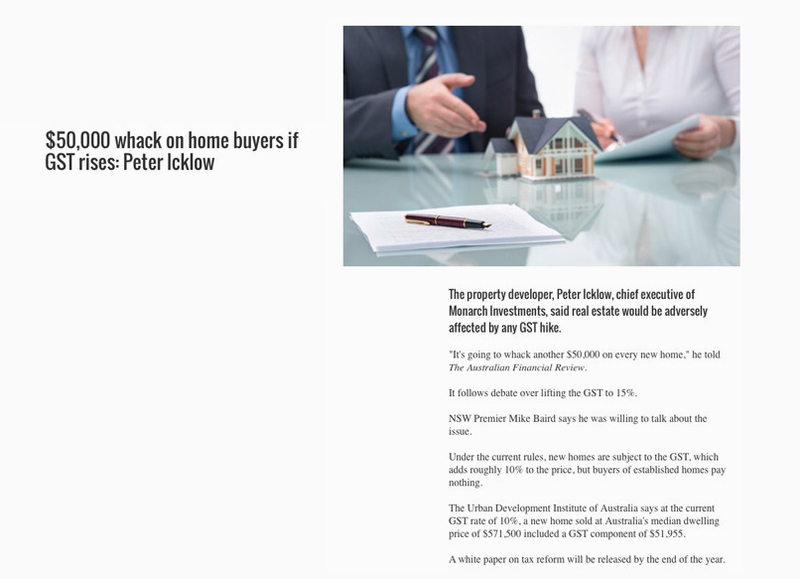 The property developer, Peter Icklow, chief executive of Monarch Investments, said real estate would be adversely affected by any GST hike. “It’s going to whack another $50,000 on every new home,” he told The Australian Financial Review. It follows debate over lifting the GST to 15%. NSW Premier Mike Baird says he was willing to talk about the issue. Under the current rules, new homes are subject to the GST, which adds roughly 10% to the price, but buyers of established homes pay nothing. The Urban Development Institute of Australia says at the current GST rate of 10%, a new home sold at Australia’s median dwelling price of $571,500 included a GST component of $51,955.